Tough question. I loved NYC for the experience but probably like the size of Columbus or Cleveland best. Ironically, my least favorite was Boston. Not much time for hobbies once I take care of my family and run. But I really like to read. A group of friends in the Cuyahoga Valley area in Peninsula, OH but a lot on my own as my schedule is hard to work around. Favorite books are The Tale of Two Cities and Pride and Prejudice. I just finished Love in the Time of Cholera. Raise my children the best I can. Keep running as long as I can. Win a 10K. Finish school and get a job teaching. Running is just a part of me. To not run is much harder as I have found out through injuries. I have run for as long as I can remember. I love the feeling I get after a hard run. As I get older and my children’s lives get more demanding, I also find running to be a great stress reliever and a way to decompress. Being 48, I am racing the clock on PRs. 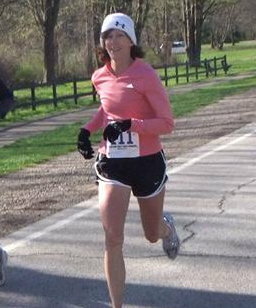 I ran Columbus in 2010 and had an outside goal of breaking 3:10. I was really unsure if I could do this. I was late to the start and could not get with the 3:10 pace group. So, I was on my own. Did well through mile 18 then started to slow. By mile 20 I thought, “I cannot let this slip away” and started picking up my pace again. My secret weapon was my 15 year old daughter waiting at mile 23. She ran me in the last 3 miles and I did break 3:10. Exhausted but elated. I have always wanted to pace. I have used pacers in the past and think they can really help people achieve the goals they have trained so hard for. A pacer can help get you past mental barriers in the later parts of a marathon. I was fortunate to have a friend who got me I into pacing for the 2011 Cleveland Marathon. It was one of my best marathon experiences ever. I loved it. We had a good size group of runners who stayed with us the whole race. It is awesome and inspiring to see someone reach a goal and to, hopefully, help them in some way. I have only paced Cleveland so far. One of the best parts was that there were 3 pacers in my group. So, we could spread out a bit. In the last few miles, I was able to go back and pick up a few struggling runners from our group and keep them on pace. The best part was seeing all our runners at the end. They were so thrilled with their accomplishments and it was so fun sharing in that. Because I can provide encouragement, entertainment, distraction and sometimes a bit of nagging to help them reach their goal and have a great marathon experience. Relax and have fun with it for as long as you can. The last miles are always tough but if we all focus on staying together and relaxed, we will get there. I do a lot of volunteer work around my children, their school and our church. I am a cub scout and girl scout leader as well as a track and cross country coach for my kid’s teams. I also like to volunteer at races as often as possible which is really only a few times a year with my kid’s schedules.